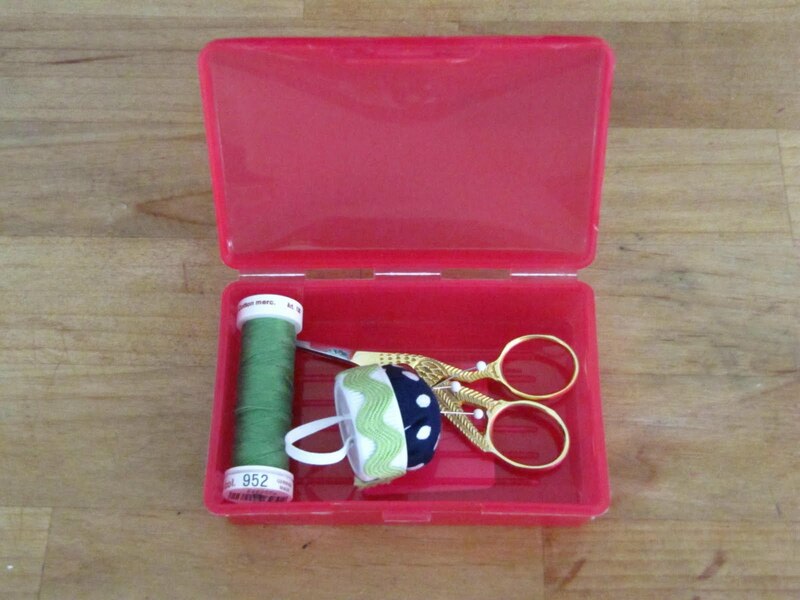 Are you excited for a new Sewing 101 post? I know I am! Welcome February's guest, Karen! Hi Everyone! My name is Karen from the blog Sew Many Ways...I want to thank Chris for having me here today. Not only do I love to sew, but I also love to organize and repurpose things for different uses. We all have a favorite craft, but if we don't know where all our things are, we could be wasting valuable sewing or crafting time!! 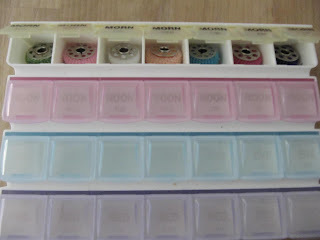 Below are a few (well, not a few...36 to be exact LOL) pictures to help you get a little organized in the area where you sew. Whether you have a big space or the dining room table, maybe a few of these ideas might help! 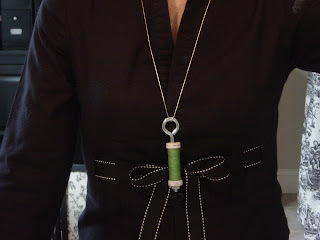 Use golf tees to keep the matching bobbin on top of the spool of thread. 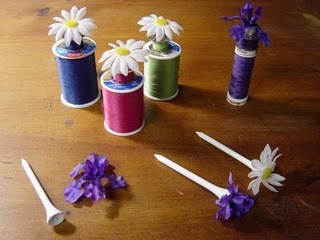 Just hot glue a little silk flower on top to make it pretty. 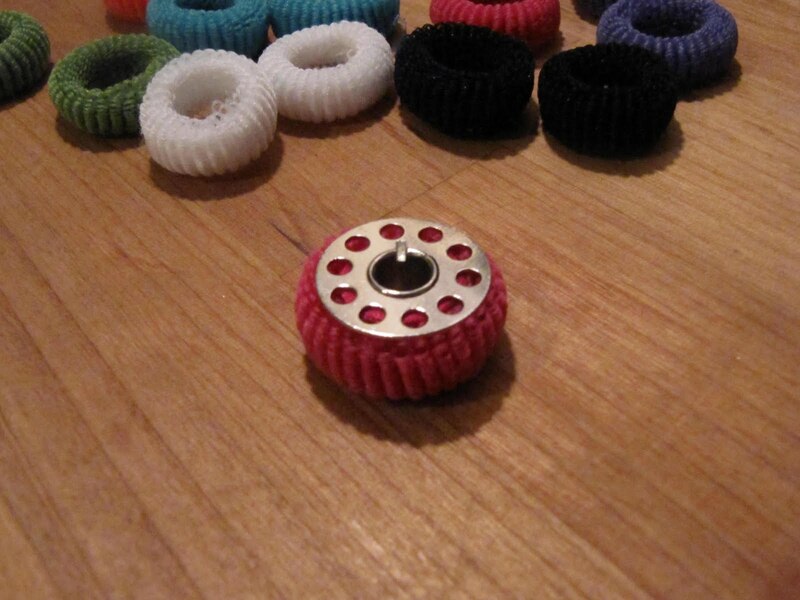 To help keep that crazy bobbin thread from unraveling, just use a tiny hair scrunchy to wrap around the bobbin. If I can find one to match the color of thread...that's even better. 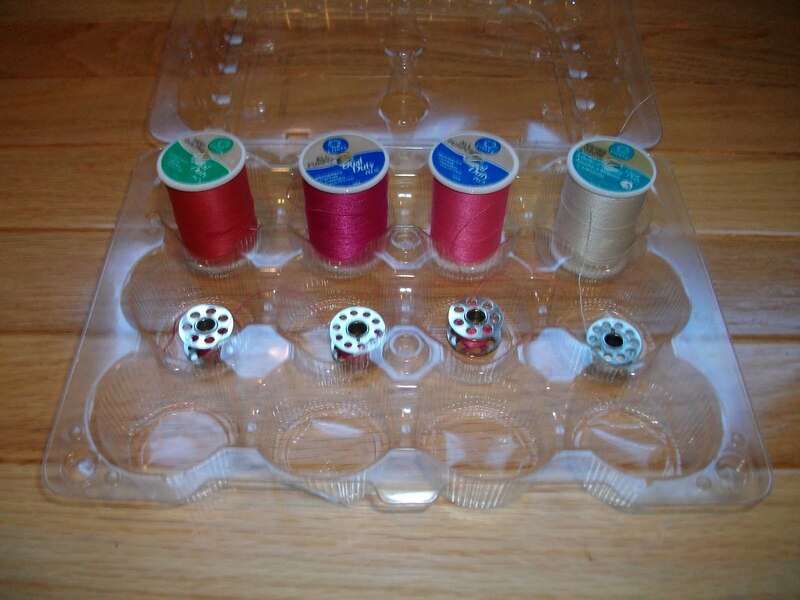 Traveling to a sewing class or a friends house to sew...keep your thread and bobbin in a recycled cupcake plastic container from the bakery. 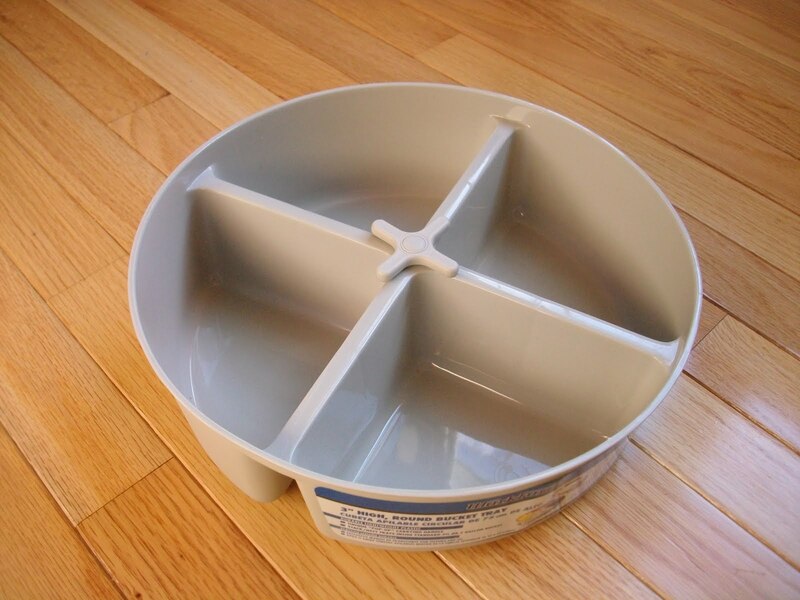 The cover keeps things all organized and clean. 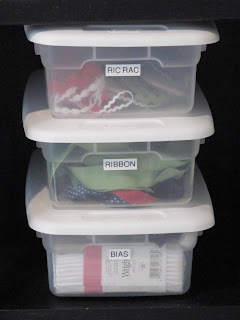 Keep your thread in different containers. This old tool box not only keeps my thread all in one place...I love the way it looks. 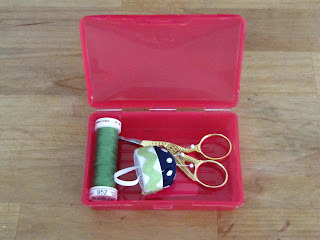 Need a little sewing kit for hand sewing when traveling...plastic soap dish to the rescue! 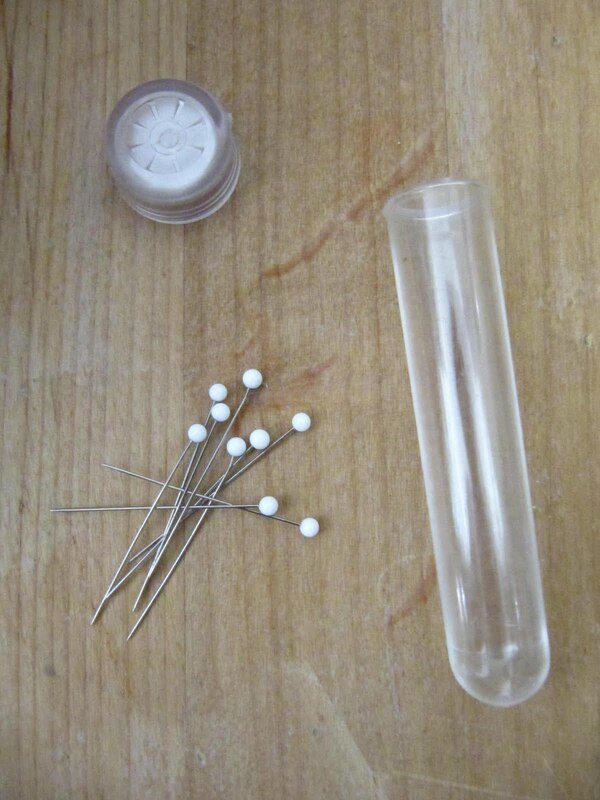 or how about an eye glass case for a kit too. This is a jumbo one. 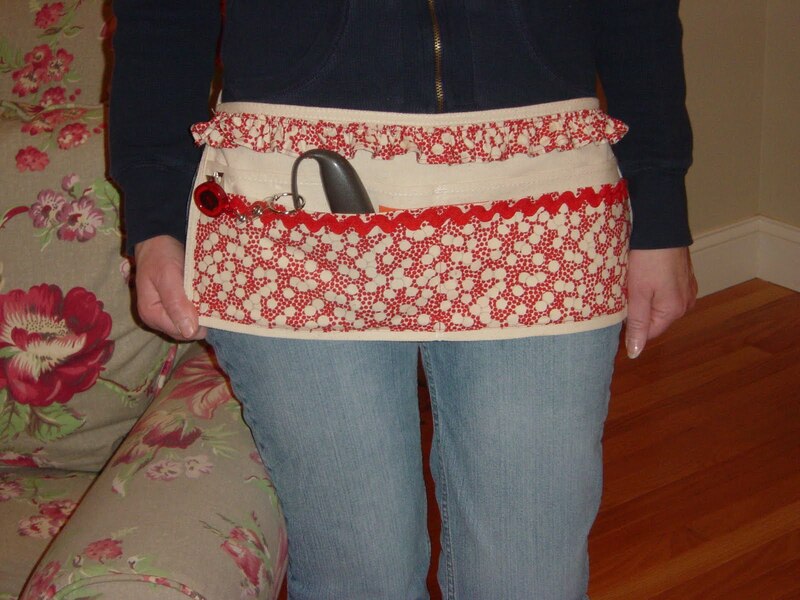 Do you do a lot of hand sewing or quilting? 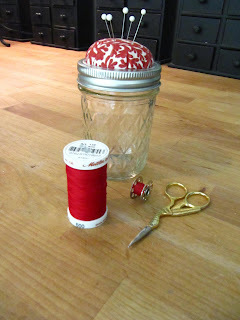 Does the spool of thread keep disappearing? 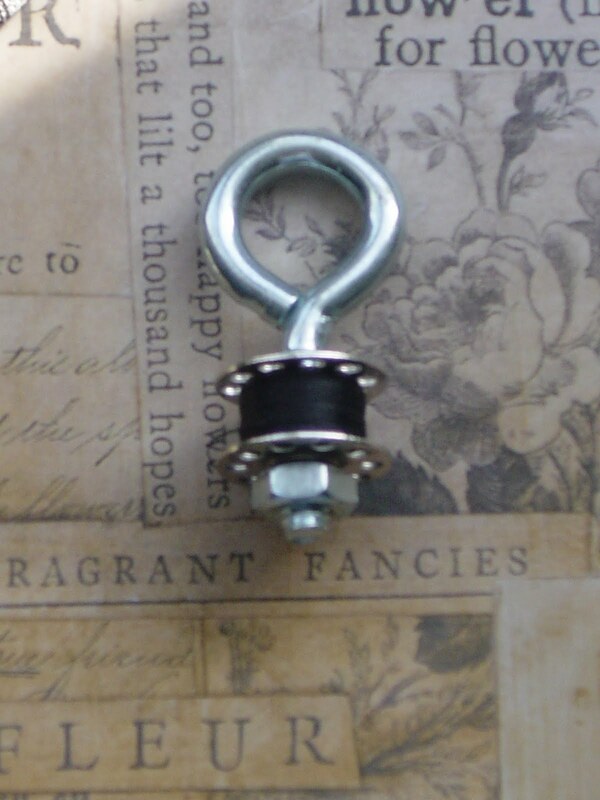 Well, why not buy an eye bolt from the hardware store and add a necklace to it. 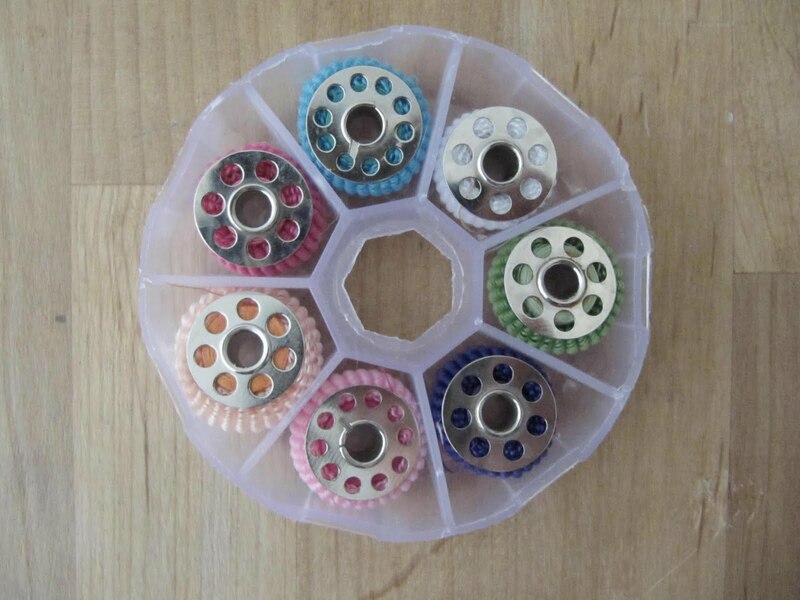 You'll never loose your thread again. Tiny eye bolt for a bobbin of thread. 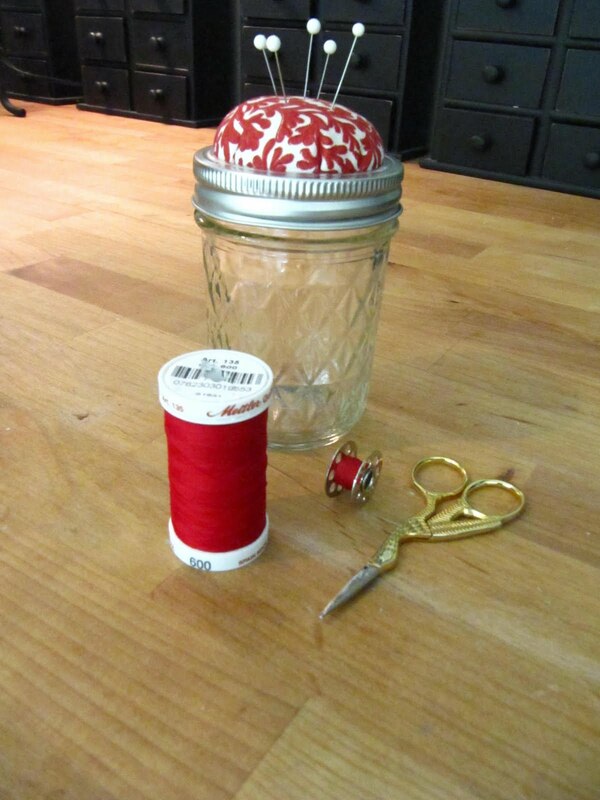 This is a mason jar pin cushion...they make great gifts for sewing friends. 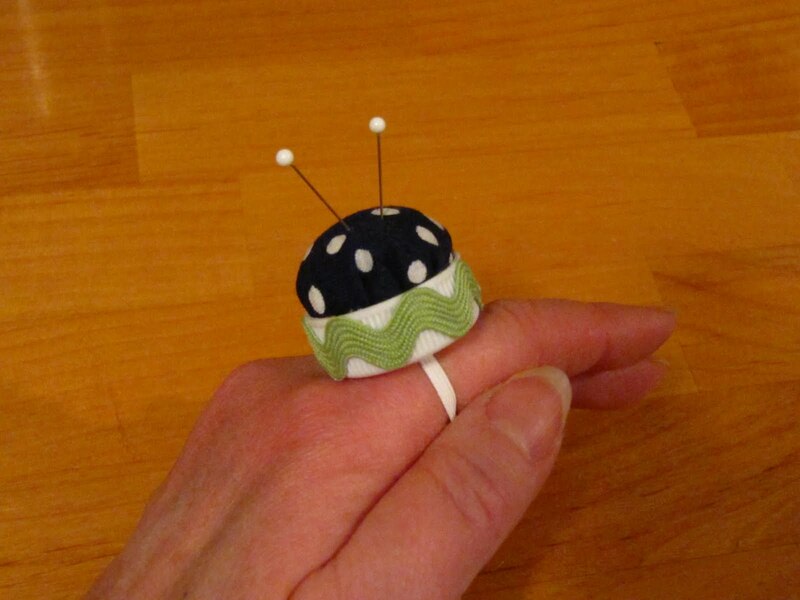 Handy dandy finger pincushion ring made out of a bottle cap and elastic for the ring. 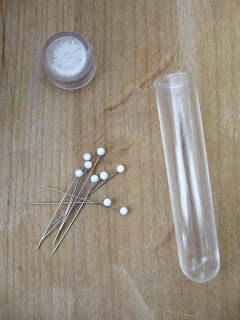 I used the plastic vial that comes on the end of flowers from the florist to hold pin or needles when I needed to carry them with me for hand sewing or a class. I bought this tooth brush holder, but the tooth brushes kept slipping out. 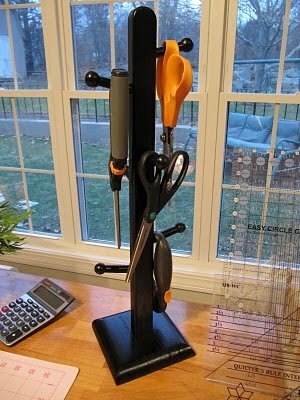 Now I use it to hold my small scissors next to my machine. Repurposed mug tree for all my scissors and rotary cutters. 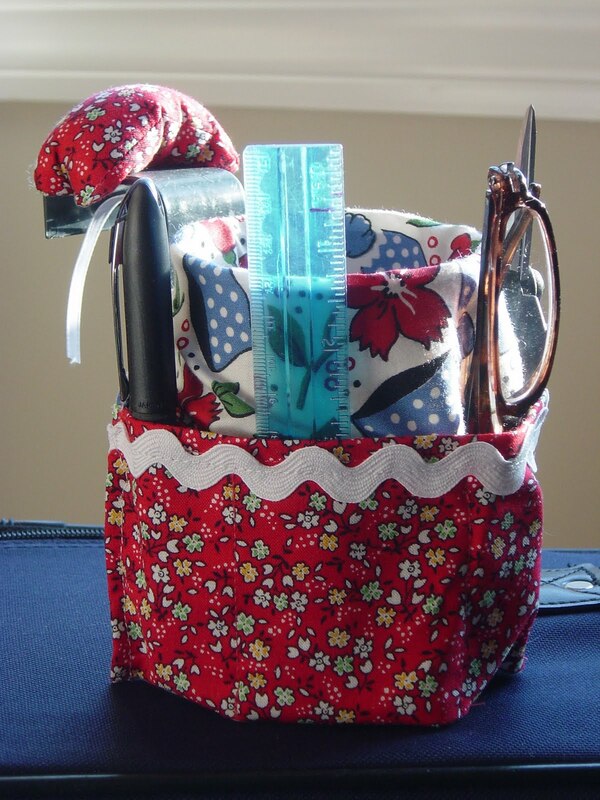 Why not keep all your sewing essentials right where you can find them...ON YOU!! I bought this apron at Home Depot for 79 cents and added the cute fabric to make it my own! 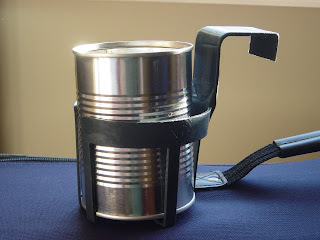 For this idea, I used a cup holder for the car and a fruit can. 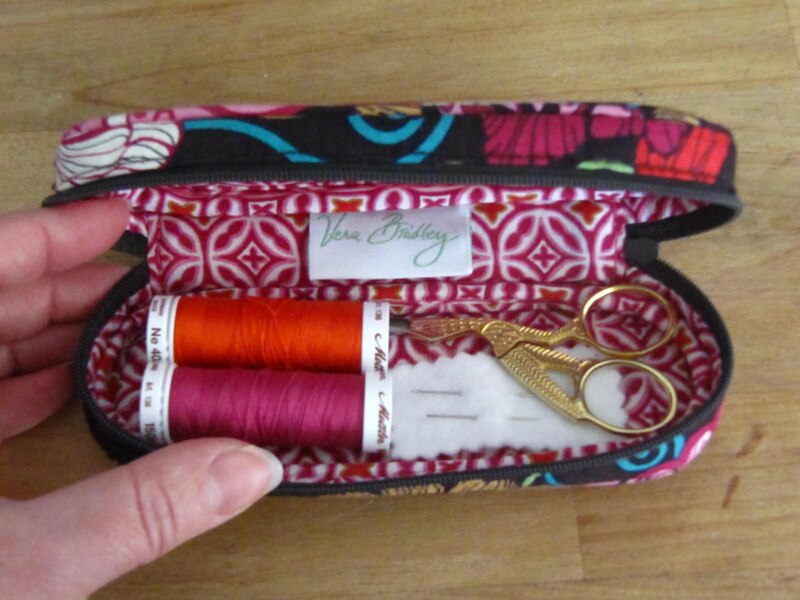 I made a little insert to hold all my sewing things when I'm traveling in the car. 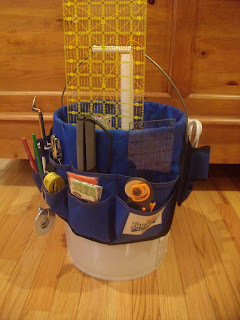 Back to the hardware store...big bucket and a tool organizer. 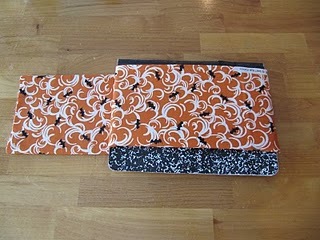 Great for sewing, gift wrapping and other craft supplies. You can also buy an insert for inside too. You can keep all your fabric underneath inside the bucket and then place the tray on top of it. 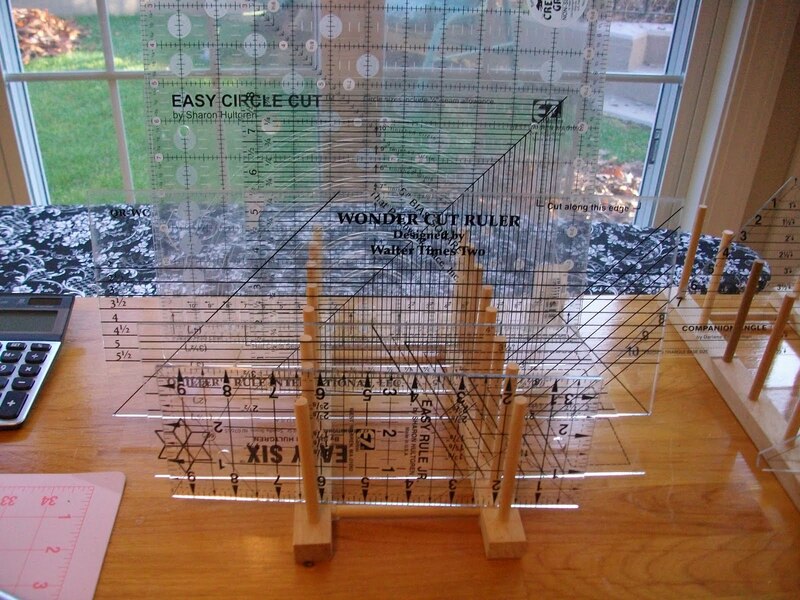 I use 2 wooden plate racks on my cutting table to hold all my quilting rulers. I attached 2 curtain hooks and a curtain rod to the side of my cutting table. 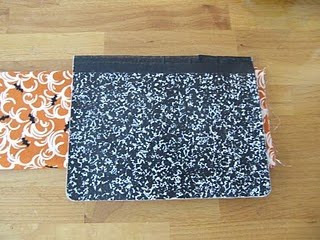 This side holds my freezer paper and my Heat and Bond paper. 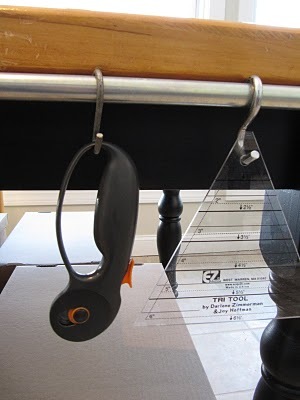 Add "S" hooks to hold scissor and rulers. This was a recent Tool Time Tuesday. 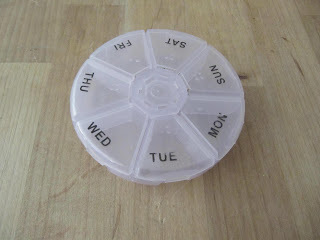 Tool Time is a feature I have every week to show different ways to use things and think "outside the box". This is a magnetic frame that I made and then used Solo plastic cups with lids to store all my small craft times. I hot glued magnets to the bottom of all the cups. The bookcase holds all my larger craft things. 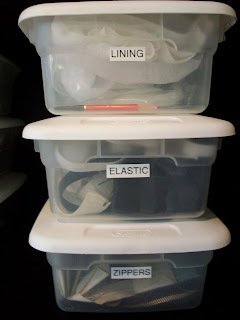 I keep all the larger items in labeled plastic boxes. 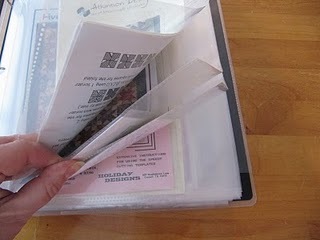 I keep all my patterns in plastic file folders from the office supply store and then store them in a 3 ring binder. 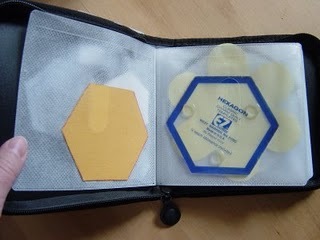 This is an old CD case. I keep all my small plastic and paper templates in here. These are plastic name badge holders on a key ring. 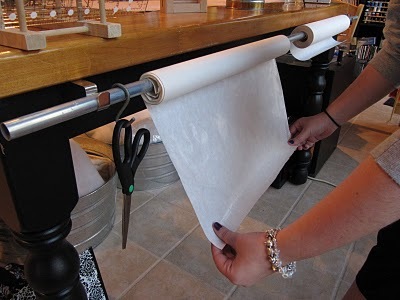 This is great for holding swatches of fabric for a project. Wonderful to take with you to the fabric store to match more fabric. Here's a great tip when sewing at your machine. Lower your ironing board to your chair level and you won't have to get up for all the quick presses. Here's a quick tip to fold your fabric. 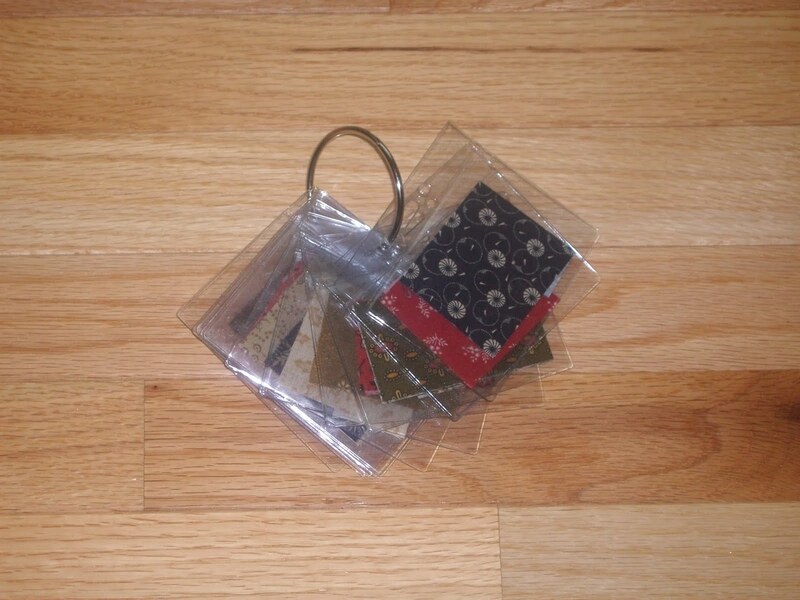 Wrap it around a piece of cardboard that is the depth of the shelf that you store it on. 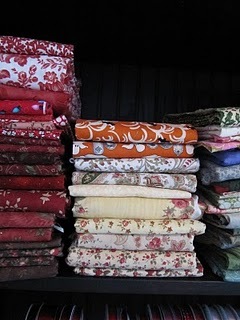 All the fabric is stored the same way...nice and neat and easy to find. and last, but not the least. 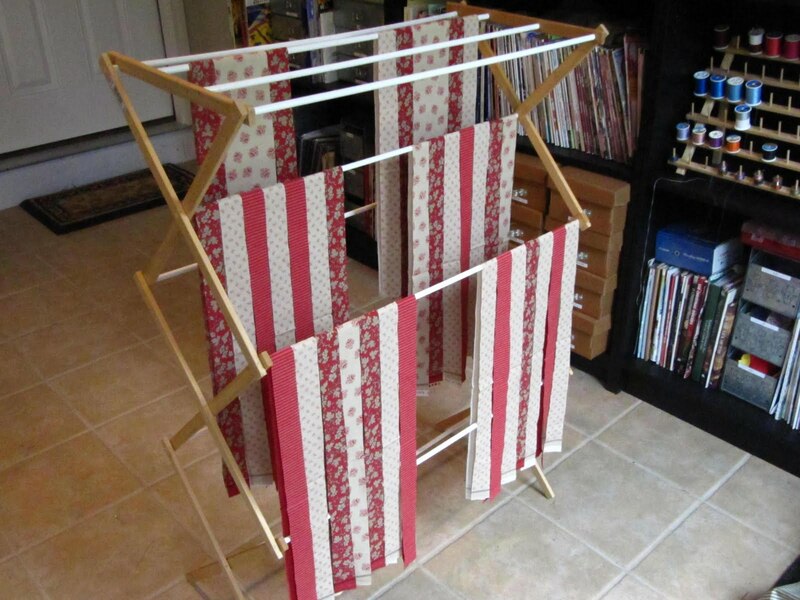 I use a wooden drying rack to keep all the pieces of fabric in order of how I have to sew them...especially important in quilting. I hope you have enjoyed all the helpful hints to make your sewing life easier. If you want to read more of my organizing tips, you can click here. 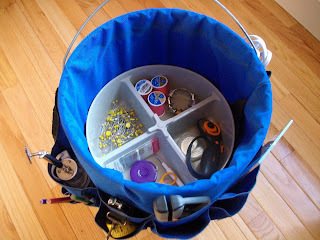 If you want to see some of my Tool Time Tuesday ideas, you can click here. There are also individual links to all of the above ideas under the "Labels" section of my side bar. Come on over for a visit. Thank you again, Chris, for having me here. I can't wait to meet some new friends from your blog! Thank you, Karen for some fantastic and frugal ways to round up all of our sewing supplies. I am so excited to try some of these out! Be sure to visit Karen's blog. For those of you also new to blogging, she's had a wonderful series called Blog Buddy sharing all kinds of tips and tricks to make blogging understandable and fun. Wow! Can you come play at my house? 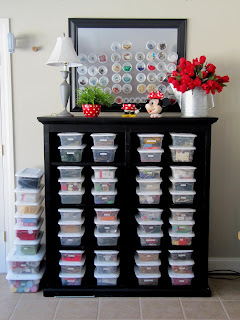 :o) Cannot wait to use some of your fabulous organizational tricks. I LOVE the golf tees idea especially. Thanks for sharing. Happy Saturday! Thanks for sharing such great ideas. I'm in the process of organizing my sewing area and can see myself using some of your ideas. So many wonderful ideas... thanks for sharing them! You may be sure I'll be borrowing quite a few to help me be more organized in my sewing room. Thanks for all the tips. I have been working in my studio too...organizing. I like how your fabric folds are all the same size. This is one of my biggest challenges. Nice post! Lots of info. 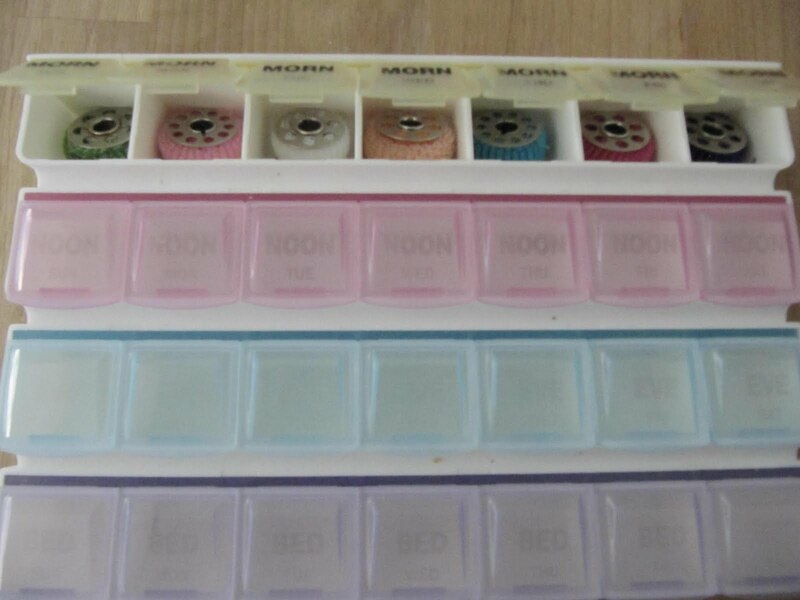 I like the bobbin storage. I keep mine in milk sample bottles. 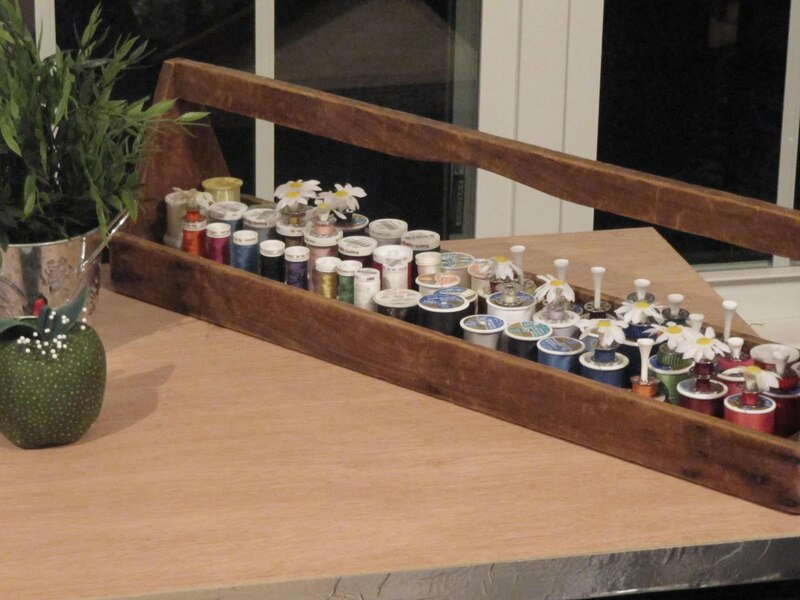 Amazing post, there are just a ton of super and accessible ideas to make one's creative space work better. As always, I love this sewing 101 series and this is a fantastic project post!!! I just found your blog last night. I think you are going to change my life! Very clever ways to think about storage and unusual items! WOW! This is an awesome collection of awesome ideas! Very inspiring THANKS! What great ideas! Why didn't I think of those. Karen, you have such wonderful ideas! I really think you could make a career out of it. You could advertise to go organize someone else's house. I think you'd have a lot of takers. Lovely ideas and thank you to Chris for inviting us to her Blog. Chris, you have some really great ideas on your post. I am in the middle of reorganizing my office/sewing room and will post pix when I am done. 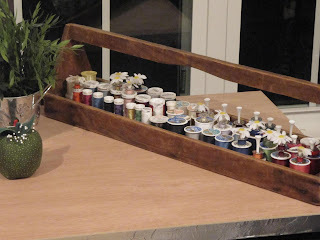 I plan to share your post on my studio solutions blog tomorrow! some fantastic ideas!!! thank you so much there are a few i will be using for sure! those are some fantastic tips-I think I love the golf tees the best! Now that is what I call getting a lot for your money. All the tips on one blog posting! Awesome. thanks. Great ideas! I love the little scrunchy bands to hold the bobbin thread! Wow, what wonderful tips. 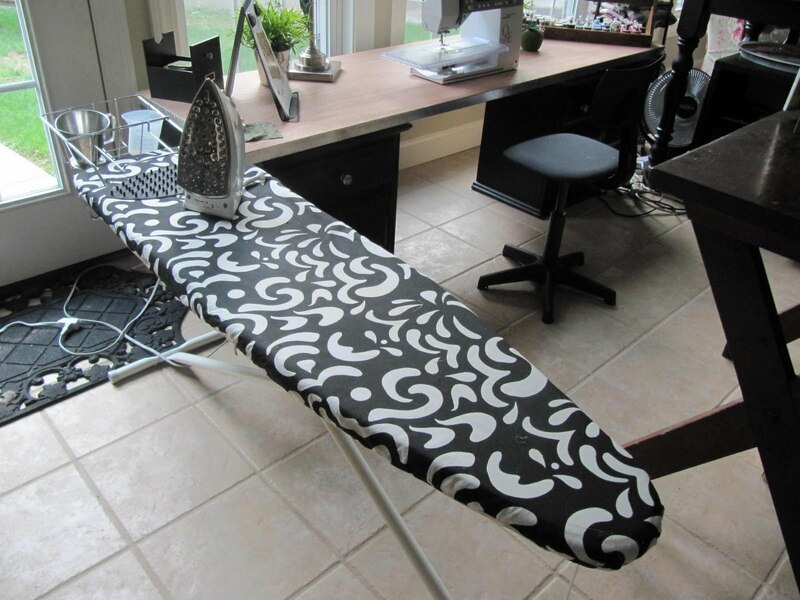 The ironing board at sewing table level is genius! How is it that I've never thought of this, brilliant! Fantastic ideas! I am definitely going to have to try some of your storage tips! Love the mug tree idea! These ideas are so great. A lot of them are screaming "why didn't I think of that?" But . . . I didn't. Thanks for sharing -- I won't look at pill boxes and CD cases the same way any more! Fabulous! So many new ideas to help me get my act together! Thank you! I really like all the ideas. I will have to save the page. I already have plans on putting a few ideas together as gifts. I do have a stackable parts organizer that fits into a 5-gallon pail. My husband picked it up at Lowes and when I made a comment about using it in the sewing room he said, "go for it", so I did. It works well for my small items. Thanks Karen! (and Chris!!) I am Chris' aunt Karen and I loved all of your ideas - can't wait to use them! I wish I had done this kind of thing years ago - you're amazing! Lots of great tips there, but the ironing board one just gave me an aha moment! Thanks! Incredible ideas, Karen! So very clever. Love the mini scrunchy idea for the bobbins... genius! Wow you must be a housekeeping angel too. Lovely and useful ideas! thanks for sharing! Thank you so much for sharing your ideas with all of us! Wonderful! This was a wonderful post. I need to point out that it is VIAL, not VILE. Vile means depraved and awful, which does not go at all with the spirit of this post! Thanks, Jac. Karen and I completely missed that one! 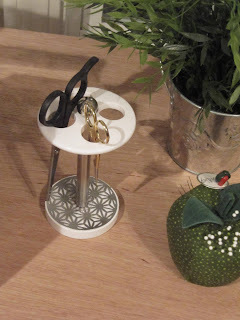 I think I like the mug tree to hold scissors the best, but these are all great ideas! What simple and great Ideas!!!!!! Thanks Indizona and Createdseams. I think Karen is an organizational genius!